Bout of Books: Bout of Books 7.0 SIGN UP! Rikki, you can add that link to our linky. 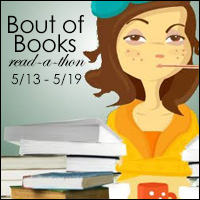 JoJo's Corner is super excited to be participating in the Bout of Books 7.0 Read-a-Thon!!! I'm sorry to bother you, but where do I upload my progress at? Do I just send a link? Each day of the readathon will have a new linky (except day 1) for you to report how you did the previous day. You can see more on our Help page. Do you have to have a blog to join? Nope! You can join if you have Twitter, Tumblr, YouTube... just about anything. You can even link up here in the comments. How about my Goodreads profile? with a sign up post in my profile comments & a link to a shelf for bout of books? Yes, you can link to a status update on Goodreads!